Malden, Mass. 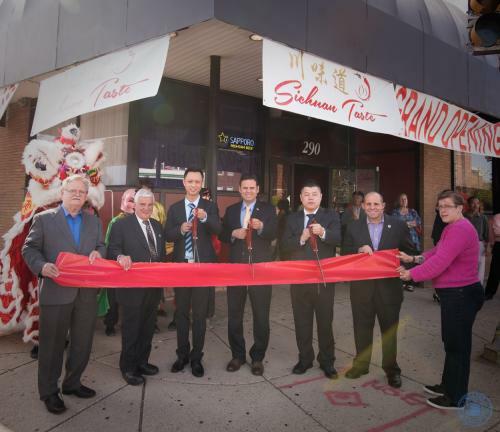 — Mayor Gary Christenson, State Representatives Paul Donato and Steve Ultrino, City Councillor Peg Crowe, employees and many in the community attended the Grand Opening of Sichuan Taste, a new restaurant located at 290 Main Street at the site of the former Bossa Nova restaurant. 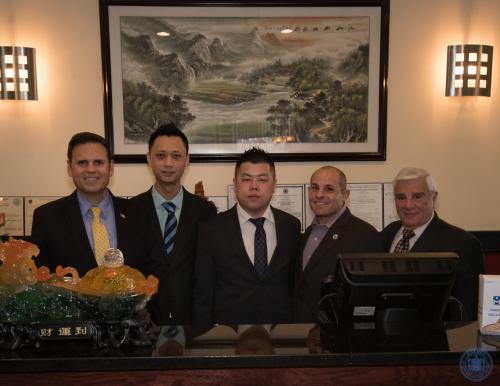 Mayor Gary Christenson, Owners Kyle Chen and Andy Chen, State Representatives Steve Ultrino and Paul Donato (Photos by Paul Hammersley, City of Malden). Cuisine consists of authentic Sichuan fare originating from the Sichuan province in Southwestern China and features bold flavors and spicy foods. Sichuan Taste features a full bar and prides itself on its modern interpretation of classic dishes and uses only the freshest and highest quality ingredients. Wah Lum Kung Fu & Tai Chi Academy performed their traditional Lion Dance to bring good luck and fortune to the new restaurant. (From left) Building owner Alex Tsitos, State Representative Paul Donato, Owner Kyle Chen, Mayor Gary Christenson, Owner Andy Chen, State Representative Steve Ultrino and Olympia Tsitos (Released by the Office of Mayor Gary Christenson. Photos by Paul Hammersley, City of Malden). Sichuan Taste owners Kyle Chen and Andy Chen have invested nearly $50,000 to improve the façade and interior creating an open and friendly style dining experience. For more information, please call 781-480-3671 or visit www.sichuantastema.com.